We’d love your help. Let us know what’s wrong with this preview of The Activist by Lawrence Goldstone. The story of the landmark case that put the "Supreme" in Supreme Court. Among the many momentous decisions rendered by the Supreme Court, none has had a greater impact than that passed down in 1803 by Chief Justice John Marshall in the case of Marbury v. Madison. While the ruling itself was innocuous—denying the plea of a minor functionary named William Marbury on constitut The story of the landmark case that put the "Supreme" in Supreme Court. Among the many momentous decisions rendered by the Supreme Court, none has had a greater impact than that passed down in 1803 by Chief Justice John Marshall in the case of Marbury v. Madison. While the ruling itself was innocuous—denying the plea of a minor functionary named William Marbury on constitutionally technical grounds—its implications were enormous. 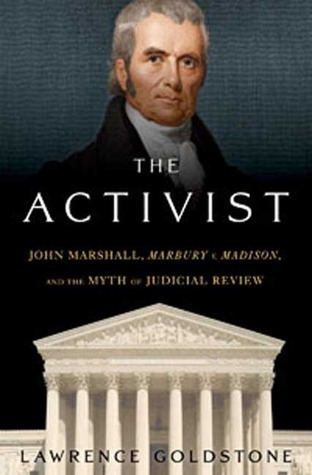 For Marshall had, in essence, claimed for the Supreme Court the right to determine what the Constitution and our laws under it really mean, known formally as the principle of "judicial review." Yet, as Lawrence Goldstone shows in his compelling narrative, that right is nowhere expressed in the Constitution and was not even considered by the Framers or the Founding Fathers, who would never have granted such power in a checks-and-balances system to unelected officials serving for life. The Activist underscores the drama that occurred in 1803 by examining the debates that took place during the Constitutional Convention of 1787—among the most dramatic moments in American history—over the formation and structure of our judicial system. In parallel, Goldstone introduces in brief the life and ambition of John Marshall, and the early, fragile years of the Supreme Court, which—until Marshall's ascension to Chief Justice—sat atop the weakest of the three branches of government. Marshall made the Court supreme, and while judicial review has been used sparingly, without it the Court would likely never have intervened in the 2000 presidential election. Indeed, the great irony Goldstone reveals is that judicial review is now so enfranchised that Justice Antonin Scalia could admit, as he has, that the Supreme Court "made it up" in the same breath as he insists that justices must adhere steadfastly to the exact words of the Constitution. To ask other readers questions about The Activist, please sign up. Goldstone creates a fantastic, extremely readable narrative concerning the founding of the US and its early growing pains. This books manages the tricky task of covering a broad range of time and people while still keeping the reader interested. There are, however, some fundamental flaws with this book. First, the premise that the Constitution doesn't inherently include the power of judicial review is not fully supported by his argument. Goldstone asserts that judicial review wasn't discussed at Goldstone creates a fantastic, extremely readable narrative concerning the founding of the US and its early growing pains. This books manages the tricky task of covering a broad range of time and people while still keeping the reader interested. There are, however, some fundamental flaws with this book. First, the premise that the Constitution doesn't inherently include the power of judicial review is not fully supported by his argument. Goldstone asserts that judicial review wasn't discussed at the Constitutional Convention only to proceed to quote George Mason discussing judicial review at the Constitutional Convention. Furthermore, the last 20 pages or so of the book devolve into what feels like a personal attack on Marshall and Originalists. It is an unfortunate ending to an otherwise enjoyable book. Well-researched, and focuses on the constitutionality of judicial review, with its primary sources being the minutes of the constitutional convention and the Federalist papers. The writer argues that Marshall basically made this up and that nowhere does it so much as suggest the founding fathers wanted to give the court so much power. Fine and educational, but did not hold my attention well. Goldstone presents a history of the US Constitution and the Supreme Court as he reviews the concept of judicial review as exercised by the US Supreme Court starting with Chief Justice John Marshall. Much of the discussion hinges on the cases of Marbury vs Madison and Stuart vs Laird, both of which opinions are in the appendixes. This work is an excellent source on the Constitution. Goldstone's articles, reviews, and opinion pieces have appeared in, among other publications, the Boston Globe, Los Angeles Times, Chicago Tribune, Miami Herald, Hartford Courant, and Berkshi Lawrence Goldstone is the author of fourteen books of both fiction and non-fiction. Six of those books were co-authored with his wife, Nancy, but they now write separately to save what is left of their dishes.